The Ibizan Maneto: a strong loyal little dog; yet another podenco type not recognized by the FCI, only the RSCE (La Real Sociedad Canina de España). In 2004 the Podenco Maneto was recognized as an indigenous race in Spain. There is no scientific evidence of how old the breed is, but there are several dogs that resemble Manetos depicted in photographs and paintings from the 19th century. The breed originated in Andalusia in southern Spain; in particular, the regions around Cadiz and Malaga are considered the cradle of the birth of the Ibizan Maneto race. The Maneto could simply be described as a Dachshund Podenco; weighing between 8.5 to 11.5 kg. The recognized colors are different shades of red and white. They have the characteristic large upright ears of a Podenco with the characteristic Dachshund legs. They are used for hunting rabbits like their cousin the Ibizan Andaluz. It is believed that the Ibizan Maneto emerged from the medium Podenco Andaluz. Controlled by inbreeding within the breed to maintain pure bloodlines, breeders have produced the mutated gene in this breed to the point that it's an obvious characteristic of the classification of the breed. The Maneto is an expert at hunting in dense brush, they are also used in narrow canyons; a are particularly suited for detecting and retrieving the prey, both on land and in water and are often combined with the Ibizan Andaluz during the hunt, as they can go where the bigger dogs cannot. Manetos also often work closer to the hunter than the Andaluz. The Maneto is used for both prey detection and killing, and also retrieves the prey when it has been shot. They hunt in packs where they help each other to detect the rabbit. They are not particularly fast, given their short legs, but they work quietly and methodically. Once they detect a prey, they stop and bark, then the other dogs move in quickly to continue the hunt. But Maneto is not just a hunting dog, they also have a reputation as very sweet family pets which adapt easily to family life. They also love being with their owner and keen for affection. They like to sleep in your bed and your feet warm during cold winter nights, and they will gladly do anything for you as long as they are rewarded with a tasty reward. 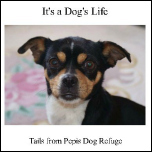 This is a dog well suited to family life because they are very kind to their own families. Another major advantage of the Maneto their short legs as they cannot use whirling drumsticks come to your face while playing, like their older cousins often do! They are affectionate to their family, but may be reluctant and suspicious of strangers; however their natural curiosity and openness prevails after a while. Especially in the beginning it is very important to a lot of time to spend with your Maneto to build a good relationship. It is a very independent and intelligent dog, with a strong temperament and character and probably see themselves as superior to other dogs, therefore it is important to Scialise the Maneto with many different breeds. The Maneto have hunting in their genes, that is, it is not something they learn, so even if you adopt a puppy, the hunting instinct could be arounsed when exposed to certain stimuli. You have to practice and train the dog, call him to you, make contact, encourage him to follow you. The advantage of their short legs is that they can't get away from you too quickly! If you are looking for a loyal friendly dog, then the Maneto is the perfect temperament for you. A narrow head in the shape of a cone and half as wide as long; a slightly pronounced stop; the colour of the nose and lips varies from honey-coloured to pink. It has big ears which can be folded; the legs are short and very muscular; height to withers approx 35cm and 11.5kg weight; convex back. Permissible colors are red and a little cinnamon to white. He is very effective for hunting birds, especially partridge and quail, and the collection of ducks on the water, he is one of the most important collectors of small game in all mountain areas and areas with dense vegetation and shrubs. All in all, the Podenco Maneto makes a very good family pet, very intelligent with a good memory, loyal, well balanced and affectionate. Give them a chance.